TUDCN has undertaken three national case studies in Ghana, Indonesia and Uruguay to analyse social dialogue within the countries in its various forms, with particular focus on the formalisation of these dialogues at different administrative levels and its contribution to development. The studies are authored by national trade union specialists and include examples of good practice as well as of limitations of the different contexts. The Uruguay case study emphasises how social dialogue spaces were opened to implement structural reforms that would deal equally with social and economic policy. In this sense, through social dialogue, important contributions were made to the raising of wages and to improvements in the social protection and social security coverage resulting in reductions in poverty and inequality levels. The Ghana case study puts forward the role of institutionalised social dialogue in increasing the minimum wage. 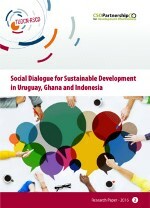 It also highlights how other forms of social dialogue, including consultations and discussions, have contributed to the elaboration of the Poverty Reduction Strategy; of national employment, youth and social protection policies; and to the inclusion of social partners on the governing boards of public institutions. The Indonesia case study mainly focuses on the role of social dialogue in reforming social security laws to cover the whole population, including workers in the informal economy. It describes the importance of social dialogue for the formulation of the two Decent Work Country Programmes, but also touches upon the contribution of social dialogue to minimum wage increases prior to the October 2015 Government reform. Source: International Trade Union Confederation (ITUC).